There's a lot of nonsense talked about Dunwich. In some books, it seems to have taken on the proportions of some mythical lost city of Atlantis. One imagines something like Manhattan, slowly sinking beneath the waves. One book I own suggests that medieval Dunwich had 50 churches! It wasn't that big, only the same size as several other East Anglian towns of the time. No, the real story of Dunwich is much more exciting than the fantasy. To start with, we need to recognise how much the Suffolk coast has changed in the last 2000 years. The Dunwich area has changed no more than anywhere else. Further south, a large number of villages and their churches have been lost to the sea, and to stand in Aldeburgh is to see a town cut in half. The Romans built Walton Castle near Felixstowe; but today, its ruins are more than a mile offshore, beneath the waves. North of Dunwich, the sea has carried off most of Pakefield in the last century, but further north than that, the old centre of Lowestoft is now further away from the sea than it was 500 years ago. Tides are funny things. The Romans knew Dunwich, and one theory suggests that it might have been Dumnoc, the see of the Bishop who would become St Felix. Miles Jebb, in his book Suffolk, describes Dunwich as the 'ignition point of English Catholicism'. However, there seems to be very little evidence for this, and more recent research seems to make it increasingly unlikely. Dumnoc was probably Walton Castle, now submerged beneath the waves off the coast of Old Felixstowe. It was from here that the missionaries set out across the land of the Angles, working very much against the grain until St Augustine arrived, and turned them into the establishment. Christianity has undergone many changes in the 1300 years since Felix and Augustine; but when the new Anglican Diocese of St Edmundsbury and Ipswich was created in 1913, the Church of England chose 'Bishop of Dunwich' as the official title of the Diocesan Bishop's assistant. If they'd waited eighty years, they would probably have made him Bishop of Walton, but never mind. The real Bishops of Walton didn't hang around for long. They moved their see soon after its establishment, and North Elmham in Norfolk became its seat. The ruins of the cathedral still survive there. The see later moved on to Thetford, and then in the 11th century to Norwich - but that's another story. Within 20 years of the Norman conquest, Dunwich was a town of 3,000 people. It had six parish churches, with at least two other chapels of ease. The parishes were All Saints, St Martin, St Leonard, St Nicholas, St John the Baptist and St Peter. Two known chapels of ease were St Bartholomew and St Michael. There was also a Knights Templars church. In 1199, Dunwich was granted a royal charter, and become a Borough, electing a council, as well as magistrates and officers, two bailiffs, a recorder and a coroner. In 1279, we are told that Dunwich possessed 80 large ships. It was, above all else, a prosperous town, and this is what marked it higher than Ipswich, which had fallen on hard times. The sea was already making incursions, but the people of Dunwich strengthened the sea walls, because this was a town worth defending. Throughout the 13th century, we read of defences being erected, and then moved as the forces of the sea changed their point of attack. In 1295, Dunwich was enfranchised to send two members to Parliament, elected by the freemen of the Borough. The decline of Dunwich begins with a storm. The 14th century was not kind to it, and on the 14th January 1328 a wind of hurricane proportions drove the sea against the spit of land called the Kings Holme, shifting the shingle so that it effectively blocked off Dunwich harbour. The harbour mouth was more or less where the car park is today. This was a disaster for Dunwich. Instead, all ships, and thus all goods and revenues, went into Walberswick instead. This was the start of a violent disagreement between the people of the two towns, which went on for nearly a century, and resulted in several deaths. But without any revenue, the town was not worth defending. The sea continued to make incursions, and during the fourteenth century Thomas Gardner reports 400 houses, 2 churches, as well as shops and windmills, succumbing to the tempest. These were St Martin, on the east side of town, which last instituted a Rector in 1335, and St Leonard. St Nicholas, the main church of the town, was cruciform with a central tower. It was last used in 1352. It was abandoned, because of its proximity to the waves, but actually survived, and became derelict, finally going over in the late 14th century. The story of destruction rapidly accelerates. As the sea approached the market place in the 1540s, the cruciform St John the Baptist was threatened. Miserably, the churchwardens sold off all the plate to raise money to build a pier to deflect the waves from their church. But it didn't work, and the church was dismantled to recover materials. St Peter stood until the 1650s, a few lonely houses huddling around it. It seems to have been broadly similar to Blythburgh in proportion and size. William Dowsing visited in 1644, and, without an inkling of the absurdity of it, ordered the destruction of sixty three cherubims (in the roof), sixty at least of Jesus written in captial letters on the roof, and forty superstitious pictures (in glass), and a cross on the top of the steeple. Before the church finally fell, the bells were removed to All Saints, and the lead and timber taken in to store for future use. The east end of the chancel went over the cliff in December 1688, the tower following ten years later. The remaining Dunwich houses were redrawn into the parish of All Saints, now the sole survivor. All Saints, we know, was Norman at its heart, with Perpendicular work from a makeover of the 1530s. This included the construction of a north aisle. Dowsing visited here as well, ordering the destruction of thirty superstitious pictures, twenty eight cherubims and a cross on the chancel. But no one wanted to live in Dunwich anymore - what was the point? The land was worthless, there was no fishing fleet, no work at all. By the middle of the 18th centry, the town had been all but abandoned. The last Rector left All Saints in 1755. The church was still used for baptisms and burials until the new church of St James was built in the village. Then, it was abandoned, and it fell into dereliction, like many Suffolk churches of the time. And yet, the town continued to elect its two members of parliament! The freemen of Dunwich had passed on their honour to their ancestors, who now lived all over England. At the end of the 18th century, or so the story goes, people would travel to Dunwich for elections, going out in a boat to the point where the town hall used to be to cast their vote. The freemen also continued to elect magistrates, bailiffs, and so on, and went about their business in a similar manner. By the time of the 1832 Reform Act, which abolished Rotten Boroughs like Dunwich, there were just 8 residents left in the constituency, which still returned two MPs. Today, you can still see the official seal and instruments of power of Dunwich Corporation in an excellent museum in the village. All Saints stood surprisingly well, and when I was younger I met an old Suffolker who remembered climbing its tower. 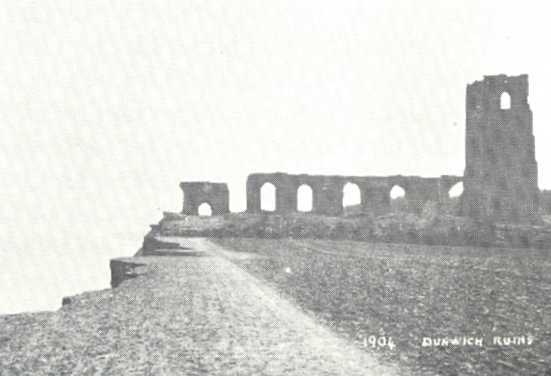 But during the early years of the twentieth century, after the new pier was built north of here at Lowestoft, the pattern of the tides underwent an alarming change, and in February 1904 the sea began to take the ruin of All Saints off to its destiny. The tower went on the 12th November 1919, leaving just a single buttress, which was rescued and reset in the graveyard of the new church of St James. Hauntingly, it carries graffiti from sightseers who visited it during its lonely sojourn on the clifftop. Also in the graveyard is part of a pillar from the former acade, recovered from the beach. All Saints was one of Suffolk's biggest churches; at 149 feet long, it was of a scale with Southwold. This gives us some idea of the speed with which the cliff eroded away. Throughout the twentieth century, people have come to Dunwich to see the last relics of All Saints. Until the 1950s, it was still easy to find identifiable lumps of masonry on the beach. When I first came here in 1985, the bones of those buried in All Saints' graveyard protruded gruesomely from the cliff, and a single gravestone, to John Brinkley Easey, stood in an inconceivably bleak loneliness at the cliff top. But this has now gone, removed to the safety of the churchyard of St James, and one would not think that there was ever anything like a town here now. The last remains of the Greyfriars monastery, westwards of All Saints, should be good for another fifty years or so. The local planning authorities have a policy of managed retreat - sea defences will not be built again in Dunwich. But it is still possible to walk through the ruins of the Greyfriars monastery, used for grazing sheep now, and through a gate near the cliff top. 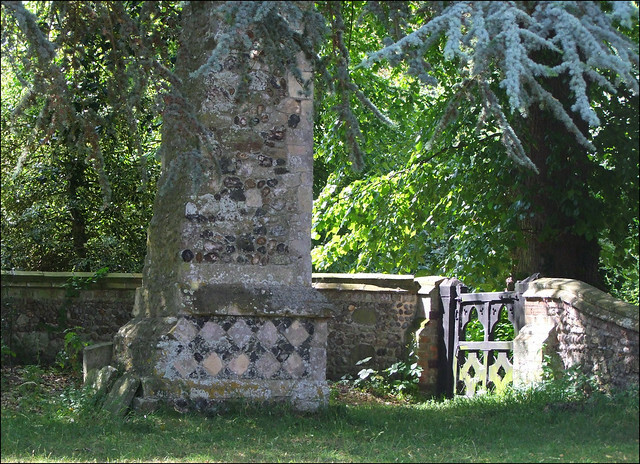 The footpath here passes through the edge of the former graveyard of All Saints. And that is all that is left. Well, not quite. For a brass rescued from the church in the mid-eighteenth century turned up in the hands of the Norwich corporation. It was given to St James in 1927, and is now proudly on display inside.